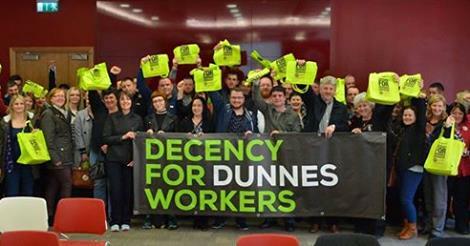 People Before Profit Councillors Ruth Nolan and Gino Kenny have called for full support for the Dunnes workers. ‘The current strike at Dunnes is a 21st century battle over precarious employment. Dunnes staff are only guaranteed 15 hours work but these hours may be spread over the week. They are not entitled to fixed hours and a first claim on any extra work that becomes available. ‘Employers often use a strategy of keeping workers in insecure conditions to stop them pressing claims for higher wages and better conditions. This happens Ireland does not have statutory protections for part-time workers seeking more hours because our governments never fully implemented the EU’s Part-Time Worker Directive. If it had been implemented, Irish workers would have a legal entitlement to avail of more hours as they become available. April 2, 2015 in News.